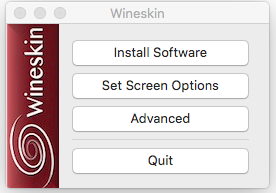 The GOG version (and I am assuming others, I do not see why it would be an issue) of Creatures 3 and Docking Station can be run on OSX using a special version of WINE called wineskin. This tutorial helps the player to configure creatures for play. 1 Step 1: Download and install Wineskin. 2 Step 2: Open Wineskin Winery. 3 Step 3: If you haven't already, download the Windows Exodus installer from GOG. 4 Step 4: Install creatures as normal. 5 Step 5: Here's where things get a bit funky. 6 Step 6: Run your game! 7 Step 7: Move Catalogue files or creature files. Step 1: Download and install Wineskin. This tutorial was created using OS X 10.11.6 (El Capitan) and Wineskin Winery 1.7 w/ engine WS91.9.11. Other versions should work, but just as a precaution! Wineskin can be found at http://wineskin.urgesoftware.com, with installation instructions. Step 2: Open Wineskin Winery. Make a new wrapper. If you haven't downloaded an engine yet, do so (just press the + buttons, select an engine to download!). I'll call my wrapper C3DS. Step 3: If you haven't already, download the Windows Exodus installer from GOG. 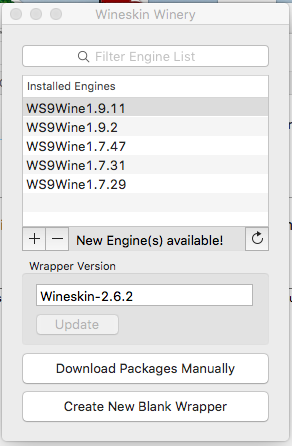 When the wrapper has finished creating, choose "view wrapper in finder" (alternatively, you can just go to your Applications folder in your home directory - it will be in the Wineskin directory there unless you have told Wineskin to do something funny!). Right click on the wrapper and select: "view contents of....". Inside, you will find a couple of directories (will be very important in a bit), and something called Wineskin.app that will do the actual work of running creatures on Mac. Double click it! 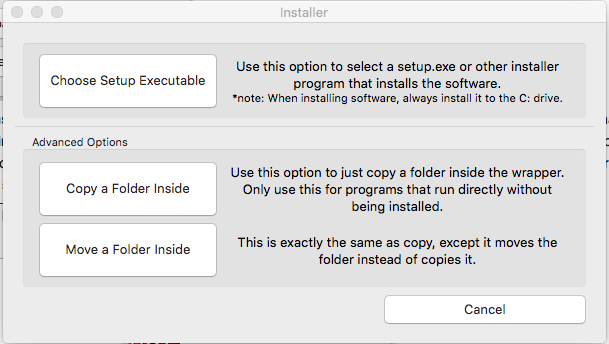 When it opens, select "Install software", and on the screen that opens, select "Choose Setup Executable" - then, select the location of the installer that you downloaded. Also, while we are here, note the drive_c in the folder: this is where creatures installs to. 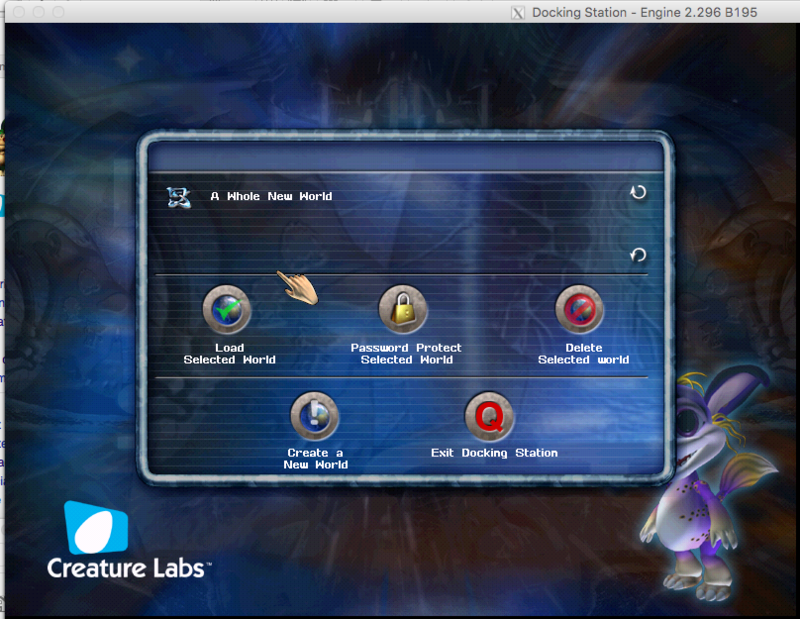 The main creatures folder for DS can be found inside the package contents at drive_c/GOG Games/Creatures Exodus/Docking Station - install agents, breeds, etc into their respective usual folder. Step 4: Install creatures as normal. Just go with all the defaults, everything should hopefully install nicely and creatures should start for the first time. Hurrah! Unfortunately, we still have work to do. Exit creatures when it starts. If you don't do the next few steps, when you go to actually play, you will get a 16 bit color depth issue. Most modern Macs don't have a built in 16 bit color mode in their driver, so we will need to do some tinkering to get everything to work. For now, though, just celebrate seeing that loading screen! Step 5: Here's where things get a bit funky. We need to change the color depth to 16 bits for C3/DS to run. To get technical, WINE (which supports running Windows apps on Linux/OSX) uses something else called X11 that supports displays and a LOT of other stuff. OSX has it's own special 'flavor' of X11 called Xquartz, and Wineskin comes with an even MORE special kind called WineskinX11. We need to replace an Info.plist file which determines a bunch of settings that Wineskin uses when it runs WineskinX11 (in this case, to specify 16 bit color). Download the replacement info.plist HEREreplacement info.plist. Going back to the same directory we were in earlier (view contents of.... on YourCreaturesWrapperNameHere.app), and open the 'Contents' folder. Delete the old Info.plist file and replace it with mine. (OSX power users: if you have XCODE installed, feel free to open it up and edit it instead: the Resolution field needs to change from something like 'novdx24sleep0' to 'novdx15sleep0' - might be slightly different on yours, but the important part is that the 24 becomes a 15 (NOT A 16, you'll error)). Step 6: Run your game! If it asks to select a main executable, navigate to DS's engine. Things should now work. If you open the Wineskin.app inside the wrapper again, you will need to either replace or re-edit the Info.plist file to be in 16 bit mode as I explained above - Wineskin.app will change things in the plist and inadvertently revert it to 24 bit color, causing the game to not play nice. The main time you would do that is if you are installing the remastered patch or developer tools - you install them by again opening wineskin.app, and selecting install software.... Afterwards, you will need to make sure that the engine is still the main executable. This will be covered more in a future tutorial - I (soliloquy) haven't figured out how well the patch will work or how well dev tools will work, so I haven't covered them here. Any Mac-friendly dev tools that worked with the previous OS X port, like Edos, or Jagent, should work fine. Step 7: Move Catalogue files or creature files. You will get a catalogue issue if you use agents such as the Garden Box, and your creatures that you export won't show up in the wineskin the way you expect either. This is much like the error that some windows players see or that was seen on the old mac port. In your home folder, you will find a folder titled "Creatures" in your documents folder; it will have all of the usual file structures - copy any catalogues which have been mis-unpacked from that Catalogue folder to the main one in the drive_c folder of your Wineskin wrapper and you should be good to go - exported creatures also may or may not end up in this My Creatures folder rather than the main one in the drive_c folder of the wrapper. This is just a first pass at a tutorial for this, sorry if it lacks some clarity! This page was last modified on 9 March 2018, at 20:08.